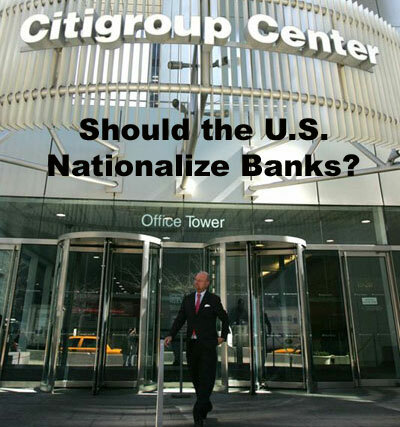 Posted on March 2, 2009 | Comments Off on Should the U.S. nationalize banks? There may be a simpler solution to the credit crunch. Last Friday, the U.S. came within a hair of nationalizing a sick major bank. The government will receive up to 36% of Citigroup common shares—what financial markets would call control—for up to $25 billion in preferred stock bought in a failed October attempt to shore up the bank’s ailing capitalization. For U.S. taxpayers, this could be a lose-lose proposition: As President Barack Obama’s newly named National Economic Council director Lawrence Summers observed last July, government sponsored enterprises (GSEs) tend to privatize profits and socialize losses. But the outcome will depend on Treasury Secretary Timothy Geithner’s next step, which he has not yet specified. Yet pumping new capital into sick banks hasn’t worked. Hundreds of billions in taxpayer funds barely dented the problem. At least Uncle Sam won’t commit ad infinitum to back Citi’s liabilities without control, dramatic policy changes and a total dividend moratorium. Common shareholders stand to see their 100% Citigroup stake tumble to 26%, but have little choice. The alternative could be total loss. Perhaps $27.5 billion in preferred and special stock may also be converted in the potential $52.5 billion deal if owners like Saudi Prince Alwaleed bin Talal, Singapore’s Government Investment Corp., Capital Research Global Investors and Capital World Investors and Abu Dhabi Investment Authority agree. Even some die hard capitalists believe circumstances so grave that the U.S. must nationalize its banking system. Besides $1.2 trillion in subprime mortgages, New York University economics professors Matthew Richardson and Nouriel Roubini contend, $7 trillion in commercial real estate loans, consumer credit card debt, high-yield bonds and other loans could lose much of its value. The International Monetary Fund and Goldman Sachs predict bank loan write downs, now above $1 trillion, could exceed $2 trillion. Combined U.S. bank loan and portfolio losses could reach $3.6 trillion, with banks absorbing $1.8 trillion, the professors project. Banking industry capital, after U.S. government assistance, was only $1.4 trillion last fall—“about $400 billion in the hole.” Based largely on Sweden’s 1992 example, they argue, only nationalization, system-wide “receivership,” would stop “the death spiral,” resolve “toxic assets in an orderly fashion” and finally let lending resume. Sweden‘s emergency bank authority resembled the Federal Deposit Insurance Corporation, writes former Stockholm School of Economics professor Anders Aslund, a senior fellow at Peterson Institute for International Economics. “It is sheer waste to try to recapitalize a damaged bank,” as the U.S. did with Citibank and others. Like “a worm in an apple,” toxic debts left alone “will devour the whole apple.” Sweden categorized banks as obviously bankrupt, under-capitalized but salvageable, or private but in “rude health.” It reviled private-public partnerships like the “telling and repulsive” Federal National Mortgage Association (Fannie Mae) and Federal Home Loan Mortgage Corp. (Freddie Mac). Only Sweden’s bankrupt Gota Bank was nationalized and merged into the government’s own bankrupt Nordbanken, which was reconstituted as Nordea, revitalized and privatized. Private banks created private bad banks, through which they discounted or sold non-performing loans. Already under government control, Fannie Mae and Freddie Mac remain prone to privatize gains and socialize losses. Respectively founded in 1938 and 1970 to fill mortgage lending gaps, both benefit from U.S. government debt guarantees. In the early 1980s they “fed off the carcasses of the thrift industry,” enabling troubled savings and loans “to liquidate mortgage portfolios without recognizing losses.” Later, their easy lending policies fueled the current crisis: In 2003, they together held over half America’s outstanding mortgage debt. The Bush administration last year nationalized both bankrupt agencies. Yet they remain guarantors of the American dream—making home ownership universally available—a goal the Obama administration hasn’t relinquished. Of most immediate concern is the banking industry’s terrible capitalization. Bank regulators require at least 6% of overall bank capitalization to be Tier 1—i.e. “intangible” preferred and special securities that ordinarily measure an institution’s health. For huge “money center” banks like Citi, U.S. economic cornerstones, regulators expect much higher Tier 1 capital ratios. But markets currently hate Tier 1 capital still more than bank common stock. Thus the U.S. devised the new Citigroup rescue plan largely to sooth markets by creating up to $81 billion in tangible capital. Taxpayers lose out: The U.S. has collected only a quarter of $2.25 billion in annual dividends originally expected on $25 billion in preferred stock since October, although besides the control block, the U.S. would retain $27 billion in two other preferred “rescue” issues to convert into “separate trust preferred securities” paying 8% annually. Unfortunately, markets disapprove. Citigroup shares fell 39% Friday, and further in after hours trading. Other banks were also pummeled. “The dose of intervention and its intended objectives will ultimately determine the validity of this temporary model,” says Romano. But as to whether political animus or President Obama’s social agenda will prevent an orderly resolution of the mess, the jury remains out. Disgraced Merrill Lynch managing director Henry Blodget calls Geithner a “weird reverse Robin Hood,” shoveling money from regular guys “into banks that vaporize it.” The U.S. should force Citi to write down its assets and convert the company’s debt to common stock. Blodget understands balance sheet toxic assets have to go. Unfortunately, “mark-to-market” accounting rules, intended to forestall managers from doctoring true asset values to disadvantage shareholders, are self-defeating in the current market. Panic has virtually eliminated normal markets, slashing bank balance sheet values for some of the most troubled assets to far less than the “near expected rate” cash flows that they currently produce. Thus the obvious, best and simplest solution, also possibly closest to Sweden’s successful model, might be removing “bad” assets from bank balance sheets at “net realizable value,” argues American Enterprise Institute senior fellow Peter J. Wallison. Translation: paying a normal market price, if there were a normal market to realistically assess. Normal prices generally approximate current cash flows “discounted by expected credit losses over time.” Bank balance sheet losses are temporary “liquidity losses,” not indicative of whether banks are sufficiently financed to continue “until liquidity returns to the asset-backed market.” Banks aren’t insolvent, and “nationalization would be a huge mistake.” The U.S. could and should simply buy assets at independently-verified net realizable values, thus significantly improving bank industry capitalization—and U.S. economic health. Ultimately, taxpayers would lose little, since the government could sell the “toxic” assets for their true value, like Sweden’s private banks eventually did. In any case, delaying puts the U.S. at risk of tumbling into something akin to Japan’s 1990s, decade-long banking crisis, Swedish economist Aslund warns. The Obama administration must “act fast” to identify, write off, and remove bad debts from normal banks—especially since assets at those banks equal at least $1 trillion, or 7 percent of America’s gross domestic product (GDP). This entry was posted in Articles, Business and Finance, Shari'a finance. Bookmark the permalink.